New Silver Bear 45 ACP ammunition manufactured by Barnaul. 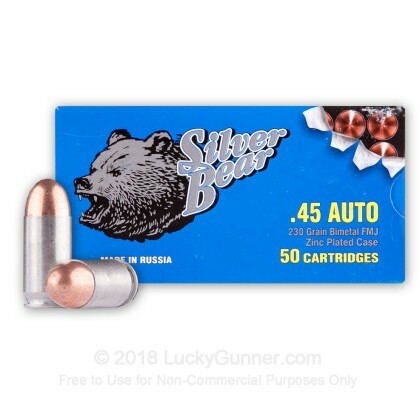 The Bear Ammo brand has its history dating all the way back to 1869 when Russian Emperor Alexander I ordered the opening of the first cartridge plant in St Petersburg. During the Russian Civil War the production facility was moved to the Moscow region from St Petersburg. Finally during WWII, Russia moved the factories to Barnaul in South-Central Russia to avoid the threat of losing the plants if Moscow was to be besieged by the German Forces. 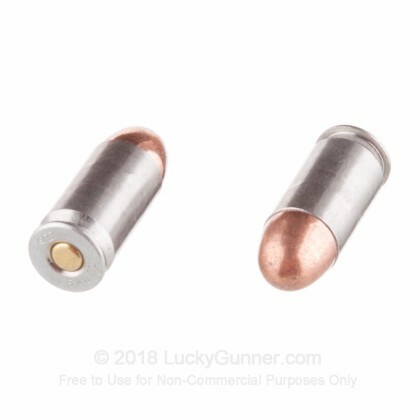 The Zinc plating on this ammunition helps the casing resist corrosion and it helps make sure you get a smooth feed every time a new round chambers. 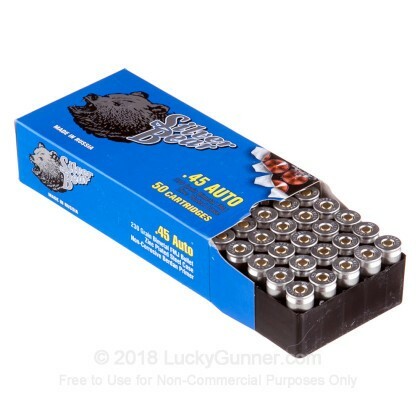 You can't get a better brand-new 45 ACP cartridge at this price!. This product has a zinc-plated steel casing, utilizes a Berdan primer, is non-corrosive and is non-reloadable. 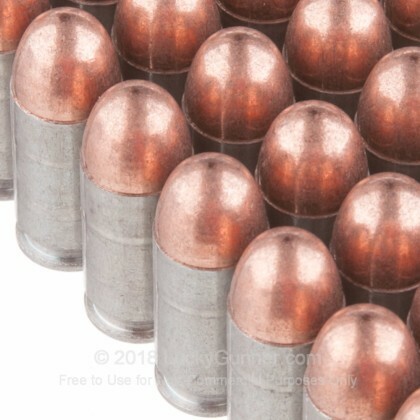 In my SIG P220, these Silver Bear rounds will have about 2-3 extraction failures per magazine. I've used the polymer coated cases produced in the same factory and did not have the same problem, so I think there's something about these zinc plated cases that resists smooth extraction. They are also underpowered, averaging 750 fps when chronographed out of my SIG. Good ammo. Great price . Used over 2000 rds recently and working on the next 1k. Extra cleaning of your hands and firearm required. multiple jams. there is a ridge from the ball to the cartridge that needs to be reduced to allow the rounds to feed consistently. I changed to another brand and neither pistol jammed. Overall these are good rounds. When the shipment arrived I noticed the corner of the actual box of rounds was dented. After opening I discovered one of the corner rounds had the bullet pounded halfway down into the shell casing. At this price per round I expected all to be pristine. I fired off the other 49 and they ran like champs through my 1911. The other thing to note is although these were not listed as remanufactured loads, the casings were so tarnished as to make me think they were reloads. 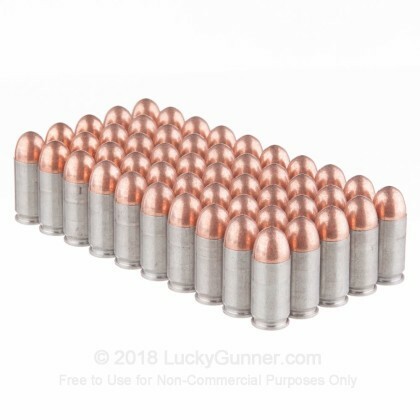 Either way, the price can't be beat and I'm glad to have some solid performing target ammo for a relatively cheap price. A: Oscar, typically ammunition will be left on your premises in the same location where most FE/UPS deliveries are left. No signature is required unless you ask for the "Adult Signature Required" service available during check-out. Every driver may choose to have someone sign for the package if he feels it may be lost by leaving it unattended, but this is far the exception rather than the rule. 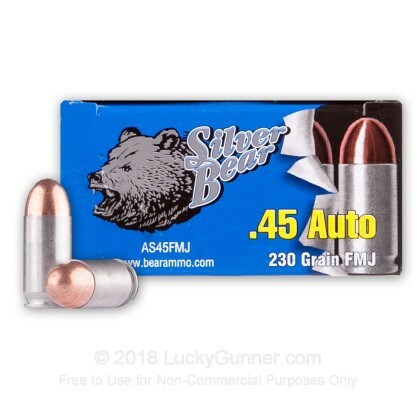 We also have this 45 ACP - 230 Grain FMJ - Silver Bear - 500 Rounds ammo in stock in a bigger quantity.